After about 52 hours of just quilting alone at the machine, we have the finished product! 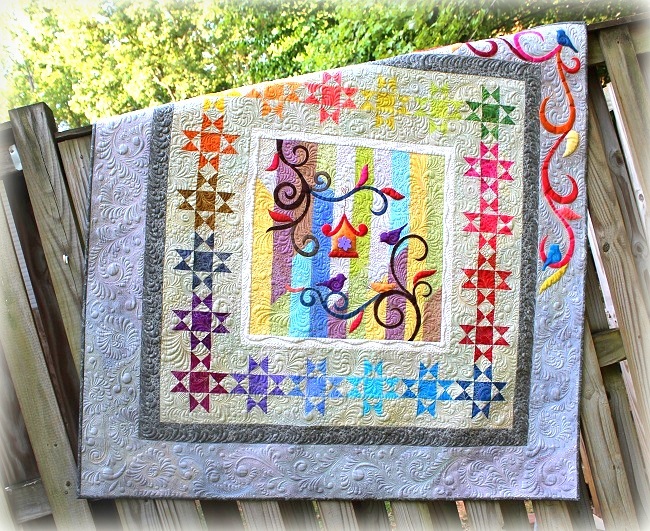 I quilted the entire quilt with colors from my Aurifil’s Subtle Strings collection. You may read more about the collection here, and exactly why those shades are chosen. You may also order the thread collection from here. And you will see how the Subtle Strings colors meet in the following close-up pictures. And here is a quick look at what the back looks like. That’s it for my Thread Journey 2.0! It’s been such a fun journey for me being able to quilt to my little heart’s content on this one. 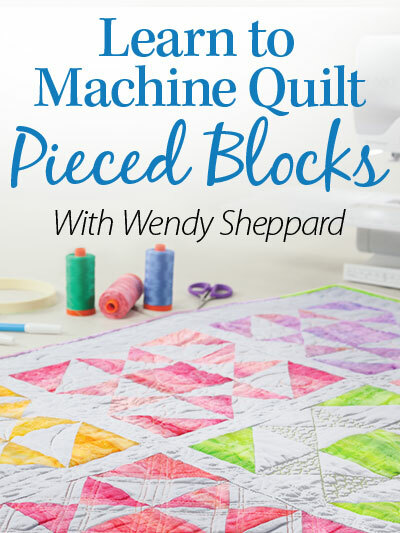 You may find the instructions on how to construct the quilt, as well as quilting suggestions here. 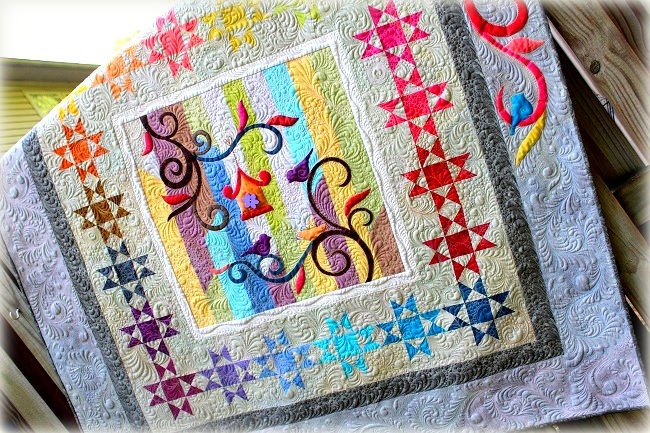 Come back tomorrow for the announcement of the giveaway winner of Windham’s Maribel FQ bundle. Have a lovely rest of your week! 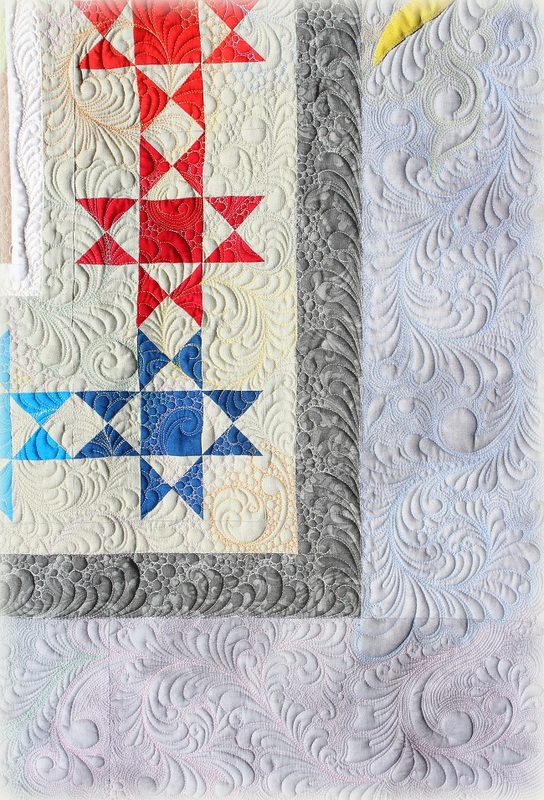 This entry was posted in Quilt Pattern, Quilting, Quilts: Pieced & Applique and tagged Aurifil Subtle Strings Thread Collection, Aurifil Thread Journey Quilt Along, Domestic Machine Quilting, Feather quilting, Free-motion quilting, Quilt Along, Wendy Sheppard Designs. Bookmark the permalink. 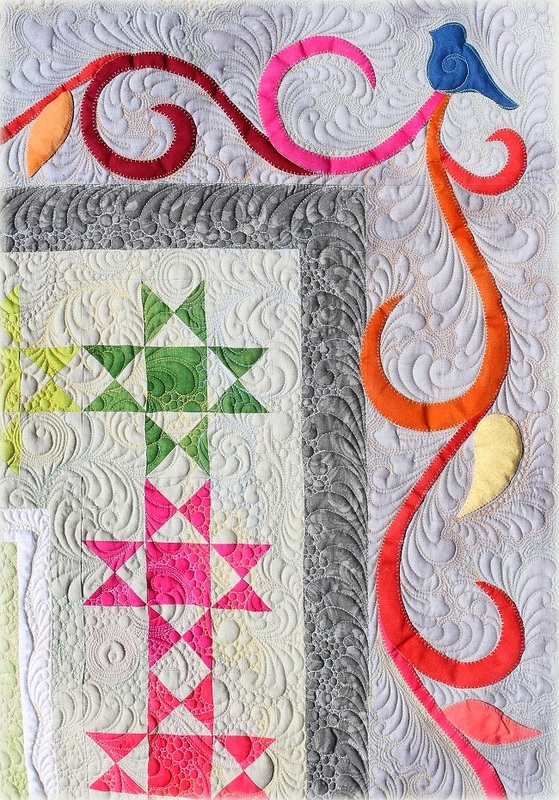 That quilting on the border is totally awesome. I am so envious. I know practise makes perfect, but I never seem to get time to practice. That is amazing Wendy. 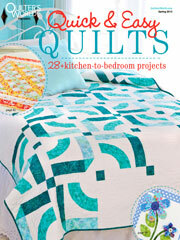 That is a lot of quilting. Job very well done. What does Miss Baby have to say about it? 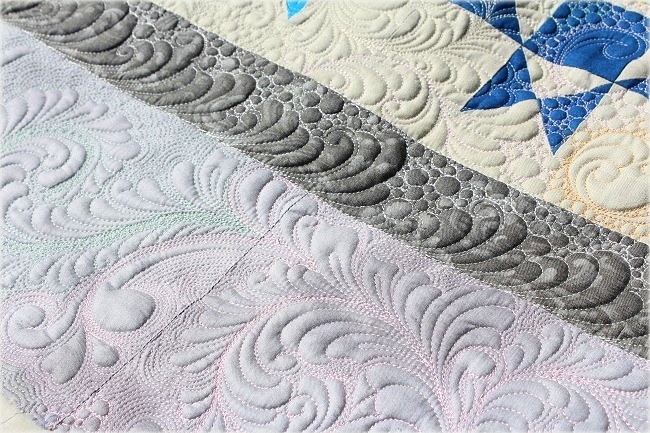 Your quilting is truly amazing! I have enjoyed making this quilt. I need to practice my free motion quilting a little more before I finish it. 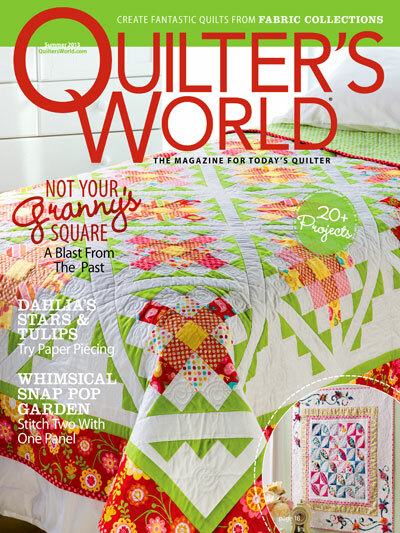 What an amazing and incredibly talented quilter you are!! Beyond beautiful!! It is truly fabulous! 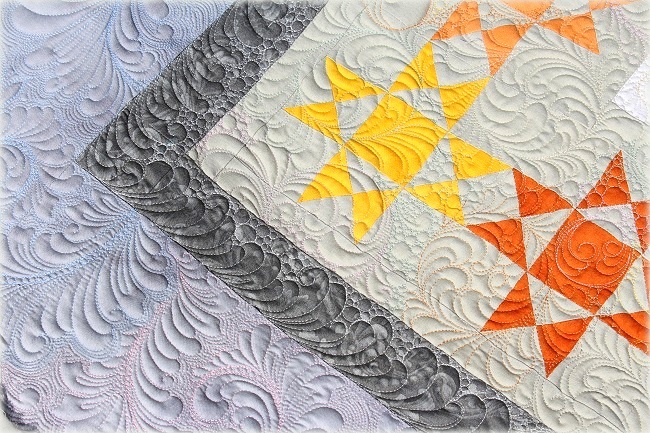 I’m so amazed at your quilting and am practicing and practicing now. So beautiful!!! Again, thank you so much for hosting this sew along. 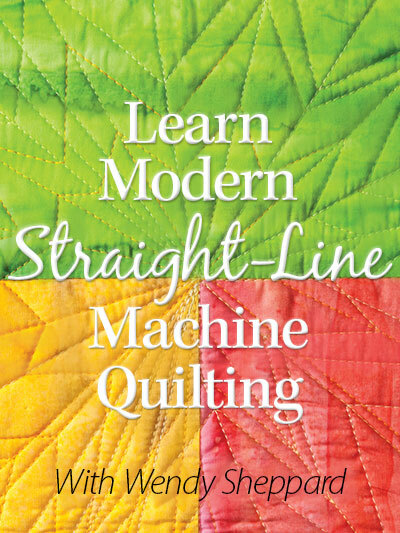 I’ve learned so much about quilting on my domestic machine from you. Wendy, the quilting is beyond words. I kept thinking-fabulous, amazing, gorgeous, fantastic. All of those descriptors apply plus so many more. I am in awe. 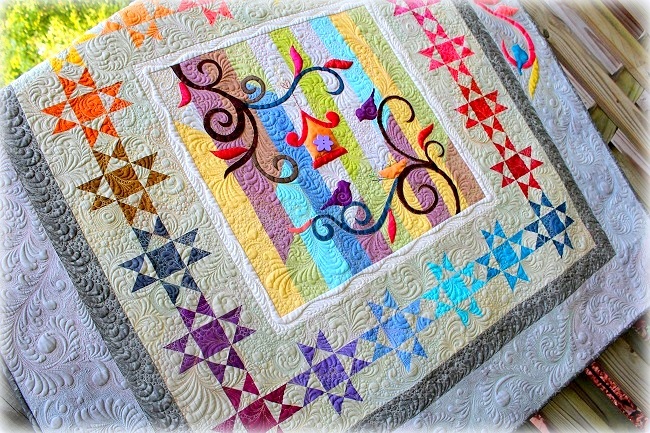 Just a fabulous pattern with the most stunning quilting. 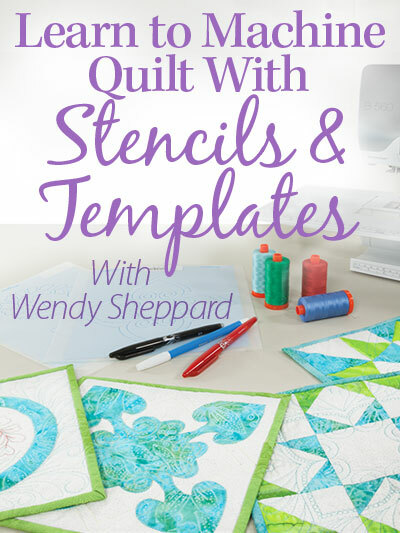 I’m always in awe of your stunning quilting, Wendy! Your work is simply stunning. Thank you for sharing and for the detailed tutorial. STUNNING!! Absolutely stunning! The textures are wonderful. LeAnne took the words right out of my mouth! Even stunning doesn’t do it justice! 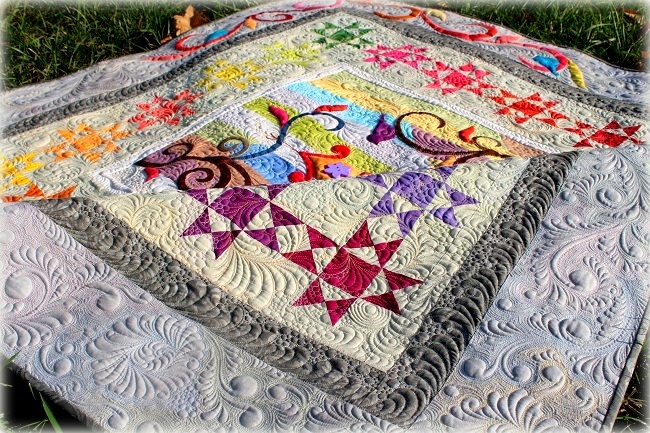 52 hours of quilting!!! Wow! It’s lovely. Just gorgeous! 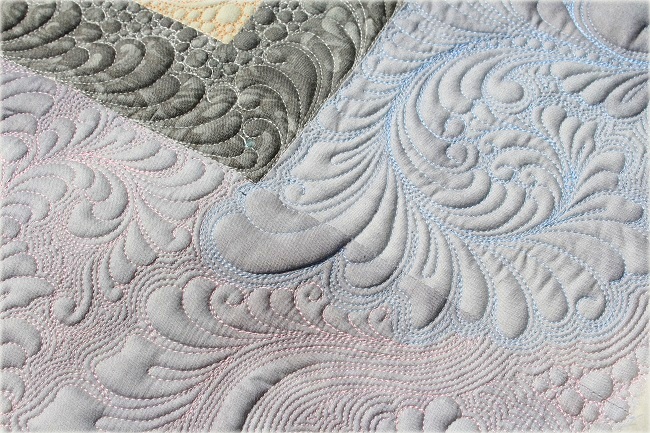 The quilting makes an incredible difference – the definition, the depth, the beauty of it!!! 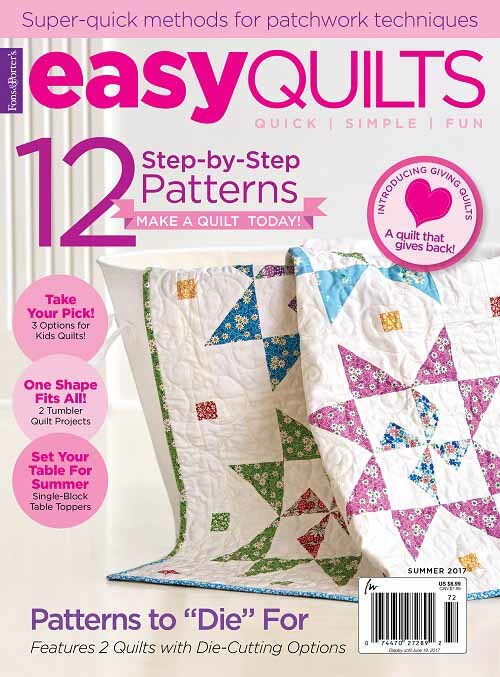 Do you have instructions for the yo-yos that were on the original quilt and part of the pattern?